Reunited for a funeral, two old friends embark on a night out in LA. 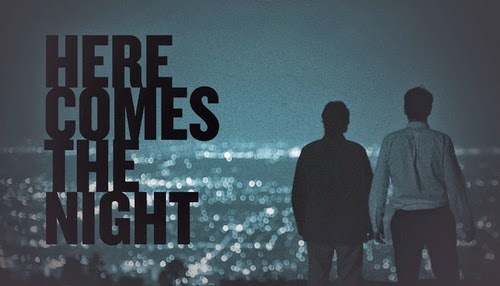 Here Comes the Night doesn’t majorly have any story or resounding impact in terms of plot, but what it lacks in that department it tries to make up with in character. I think it manages to achieve this on the whole, set in a sombre but not in any way dreary setting. This film sees a wine and spirits salesman called Leo (Haas) coming back to LA to attend the funeral of a close friend. James apparently killed himself, and his passing sees the reuniting of Leo with old friend Nick (Duhl). They’re an odd pairing, but in their strained mismatch and a night on the Los Angeles turf they may get over that tension. It’s refreshing to see the surroundings of the usually glitzy LA in a bleaker light. Of course, most of it is set during the night, so there’s not much of that bikini gal, muscled, pumped sun stroked glow, but even the buzzing nightlife of this city so often seen is swept aside to let Nick and Leo breathe as characters coming to terms with James’ death and each other. It feels like there’s something always waiting to trip them up around every corner, and a lot of the time there is, maybe not dramatic or exciting, but they’re obstacles nonetheless. As the night progresses, it’s evident that these two middle-aged men are friends, and in a way you grow to like their relationship. In other ways, this film can feel boring, and the friendship can be dull or unbelievable. Firstly, it’s just a story jump to get things moving for Leo to go along with the frankly annoying Nick. He does settle down as the running time extends, but by then it's too late. On another note, the film takes an extraordinary amount of time to leave you feeling attached to these guys. I checked, and it wasn’t until just before the hour mark that I started liking them both and began getting into the movie in general. Considering the film is only an hour and 25 minutes, that’s not overly great. The whole picking up scene is mildly amusing and soon gets very surreal, as the girls they meet at the mini golf bar are weird and subtly dark in their mushrooming, séance and after dark pleasures. It’s probably the most interesting section of the film to witness unravel, as you see the characteristics of Leo and Nick tested under the youth and unyielding spirit of these two lasses. Leo particularly becomes more dynamic as his goody two shoes act and quite two dimensional all work no play attitude is lost to the charms of Tricia. It’s shot ever so well, with close ups aiding the drug influenced atmosphere, moody lighting making the entire scene feel more dangerous and mysterious, and the appearances of some new actors giving the male leads someone else to bounce off. The score by Andrew Deadman is quite drastically lacking. I get that it’s mellowed and quiet, to reflect the mood of the night-time structure, but there was scope for some more interesting music that could have echoed the night sounds of Drive, giving it more oomph and life in the dark of the LA world. Potential, but not quite up there, as it felt slightly too uninteresting and added no magic to my ears. A good effort, and the last 35 minutes feel like a film with the developing friendship between Leo and Nick getting better and more empathetic, but before that it’s a slow uphill ride to get anywhere. The best part of the night takes a while to come, but once it does you feel the characters more.